Mmm . . . BRAINS! Experience the PopCap® game that’s won 30 Game of the Year awards — and counting — at Things From Another World’s signing for Dark Horse Comics’ Plants vs. Zombies™: Lawnmageddon hardcover with Paul Tobin (Bandette), Ron Chan (Husbands), and Matthew J. Rainwater (Garage Raja), Saturday, November 9 from 12:00 to 3:00 p.m. at the Portland TFAW. Make sure to bring the kids! Get your picture taken with an official PvZ zombie, enter to win prizes from PopCap Games, Sock Dreams, and USAopoly, and play Plants vs. Zombies in the store, courtesy of Ground Kontrol Classic Arcade. Free snacks and beverages provided. Tell all your friends, and RSVP now! The confusing-yet-brilliant inventor known only as Crazy Dave helps his niece, Patrice, and young adventurer Nate Timely fend off a “fun-dead” neighborhood invasion in Plants vs. Zombies: Lawnmageddon! Bring your signed copy home November 9 for just $9.99. Do you play Plants vs. Zombies? What’s your favorite part of the game? Post your comments below! The Comic Book Legal Defense Fund (CBLDF) has fought for the First Amendment Rights of the comics community since 1986. Now here’s your chance to join the fight for free speech at our CBLDF Liberty Annual 2013 signing and membership drive October 9 at the Portland TFAW! Meet the contributors to Image Comics’ CBLDF Liberty Annual 2013, including Jeremy Atkins (Charles de Ghoul), Ron Chan (Plants vs. Zombies), Emi Lenox (EmiTown), Michelle Madsen (Buffy the Vampire Slayer), Dave Stewart (Hellboy), and Paul Tobin (Bandette), and learn how you can join the CBLDF for as little as $25! Complimentary food and beer (for those 21+ with valid ID) provided. Sign up for CBLDF membership at the $50-$249 level to receive a Lone Wolf and Cub Volume 1 Limited Edition hardcover, while supplies last! Sign up at the $250 or greater level to receive a Give Me Liberty hardcover, signed by Frank Miller and Dave Gibbons, also while supplies last! These bonuses are in addition to the CBLDF’s own membership incentives, which include T-shirts, sweatshirts, buttons, and more. Plus, the CBLDF has donated extras of these items for our raffle, which will take place during the event! Make sure to RSVP now. Are you a member of the CBLDF? Post your comments below! We’ve got another exciting announcement about our Fifth Annual SDCC Autograph Card/CBLDF Auction event! 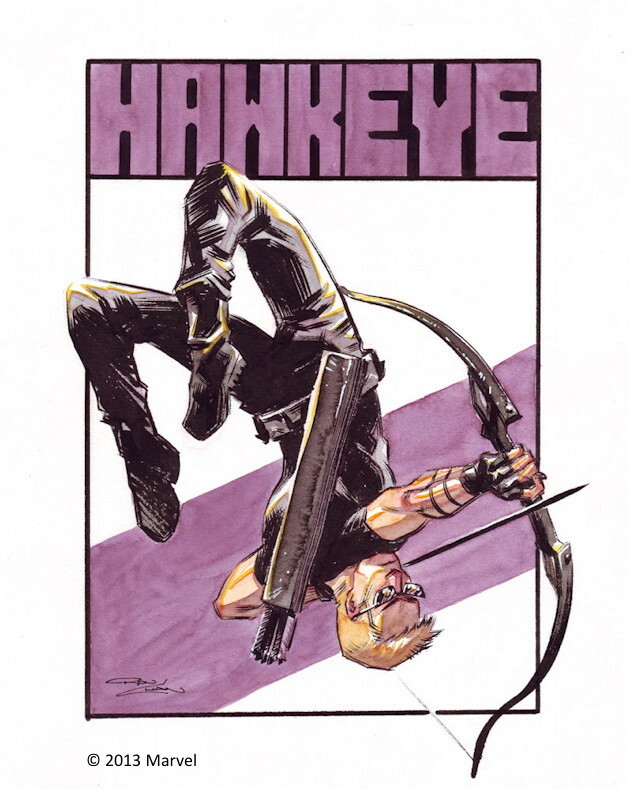 Periscope Studios artist Ron Chan (Plants vs. Zombies, Husbands), created an amazing Hawkeye sketch for the Comic Book Legal Defense Fund’s annual auction at San Diego Comic-Con, with all proceeds supporting the First Amendment rights of the comics community! Founded in 1986, the CBLDF offers legal assistance to comic book fans, retailers, creators, and more whose basic rights are threatened. Visit CBLDF.org to learn more and enjoy a daily news blog on First Amendment issues, a large and growing resource section with case files and documents on the history of comics censorship, and tool kits for artists, readers, and librarians about their rights. TFAW is a proud supporter of the CBLDF and, through the generous donations of artists like Chan, has helped raised more than $100,000 for this important cause. As a thank you, TFAW is also creating free, limited-edition autograph cards from these original sketches that will be available at SDCC! See Ron Chan’s Captain America sketch from last year, below! Going to SDCC? You can bid on the original sketch at the CBLDF Auction July 20 (stay tuned for details). Plus, remember to pick up a free autograph card at the CBLDF booth at #1920. While you’re at it, make sure to stop at the TFAW booth at #5625 to browse graphic novels and more at special low prices. Are you headed to SDCC this year? Have you ever attended the CBLDF auction? Post your comments below! See Ron Chan’s Previous CBLDF Sketch, Below! Ron Chan is the latest fantastic artist to join our Fourth Annual SDCC Autograph Card/CBLDF Auction event! Chan will donate an original sketch to the CBLDF’s annual auction at San Diego Comic-Con, with all proceeds supporting the First Amendment Rights of the comics community! TFAW is proud to have worked with the CBLDF for the past three years, helping to raise more than $75,000. Founded in 1986, the CBLDF provides important legal support to comic book retailers, publishers, creators, and even fans. Help support the First Amendment Rights of the comics community and fight censorship by joining today! 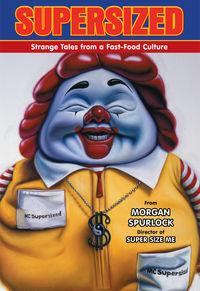 Chan is a member of Portland, Oregon’s Periscope Studio and is the artist behind The Guild: Tink, by Felicia Day, as well as Supersized: Strange Tales From A Fast-Food Culture, by Morgan Spurlock. Stay tuned for a preview of Chan’s sketch here on the blog, and see his Captain America sketch from 2011, below! If you’ll be at San Diego Comic-Con, you can bid on the original. Plus, TFAW will be turning every sketch from this event into free, limited-edition autograph cards that we will be distributing at SDCC this year. Stop by booth #5625 to pick up your set, and make sure to check out the CBLDF Auction July 14 at San Diego Comic-Con! The Guild and Supersized artist Ron Chan promised to donate artwork to our Third Annual SDCC Autograph Card/CBLDF Auction–and it’s amazing! His dynamic (and timely) Captain America piece is pictured at right. Chan is a member of Portland’s Periscope Studio and one of the writer/artists behind the webcomic Roy’s Boys. You can bid on his Captain America piece–as well as dozens of others from an amazing array of publishers and creators–at the Comic Book Legal Defense Fund’s auction July 23 at San Diego Comic-Con. You can join the fight for the First Amendment rights of the comics community: place your bid at auction, or join the CBLDF today by clicking the link below! Want copies of all of the artwork donated to the CBLDF through TFAW? We’ll be creating limited-edition autograph cards of all of these pieces and giving them away at SDCC. To pick up yours, visit TFAW at booth #5625 July 21-24! Are you going to SDCC this year? Which autograph cards are you looking forward to? Periscope Studio member and Dark Horse Comics artist Ron Chan has joined our Third Annual SDCC Autograph Card/CBLDF Auction! Chan, who has lent his considerable talents to popular titles like The Guild: Tink, The Guild: Clara, and X-Men: To Serve and Protect, will donate an original sketch to the Comic Book Legal Defense Fund’s annual auction at San Diego Comic-Con. 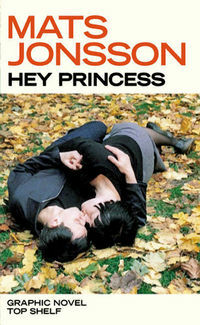 Want your own copy? No worries! TFAW will be taking all of the sketches from our participating publishers and creators and creating free limited-edition autograph cards, which we will be available at SDCC! To pick up yours, visit TFAW at booth #5625 July 21-24! Need more Ron Chan? Make sure to check out his hilarious webcomic, Roy’s Boys, with Sean Kelley. Are you going to SDCC this year? 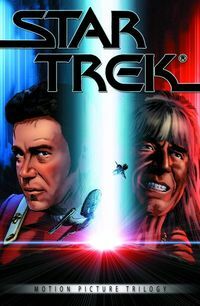 Which artists are you hoping to see sketch cards for? In celebration of the upcoming The Guild: Tink one-shot comic book written by series creator and star Felicia Day, we’ve created an exclusive print of the Ron Chan cover for Emerald City Comicon March 4-6. The print will be available for free during our Ron Chan signing Saturday, March 5 (1-3 p.m.) at Booth #612, and free with a $10 purchase before and after. 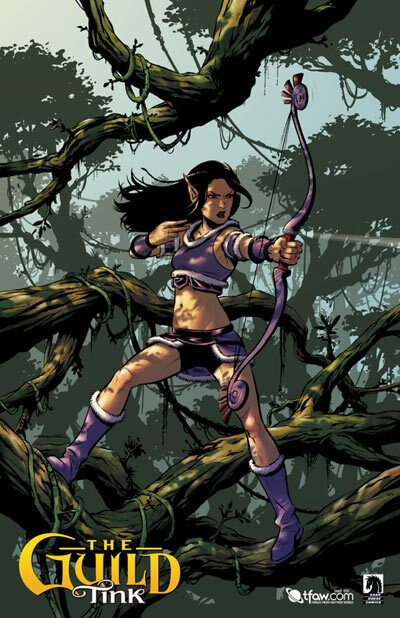 Depicting a ferocious, in-game Tink wielding her bow in a lush forest, this full-color print, at 11″ x 17″, is a must-have for fans of The Guild web series, an independent comedy about a group of online gamers created by and starring Felicia Day. Plus, both Felicia Day and Tink actress Amy Okuda will be attending this year’s ECCC and signing on the third floor at Booth C-05 all three days. Come see artist Ron Chan at Booth #612 and get a free The Guild: Tink print Saturday, March 5 from 1 to 3 p.m., right after The Guild’s panel! 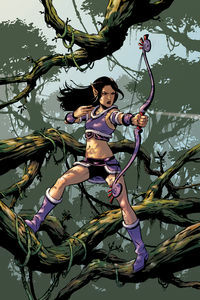 The Guild: Tink one-shot debuts March 16, 2011 from Dark Horse Comics. Are you going to Emerald City Comicon this year? How do you think it compares to other conventions? Post your comments below! Stumptown Comics Fest 2010 Videos! This past weekend’s 7th annual Stumptown Comics Fest was a whirlwind of signings, panels, and parties! The comics fest itself was extremely well attended, with thousands of comics fans meeting their favorite creators, discovering new artists and writers, attending panels, and buying comics. Things From Another World was there busily selling graphic novels, and we also shot some video, including a segment with Top Shelf’s Leigh Walton about the new Swedish Invasion, a chat with Ron Chan (Underground, Star Wars: KOTOR), a quick check-in with Atomic Arts about this summer’s Trek in the Park show, mini interviews with independent creators, and more! 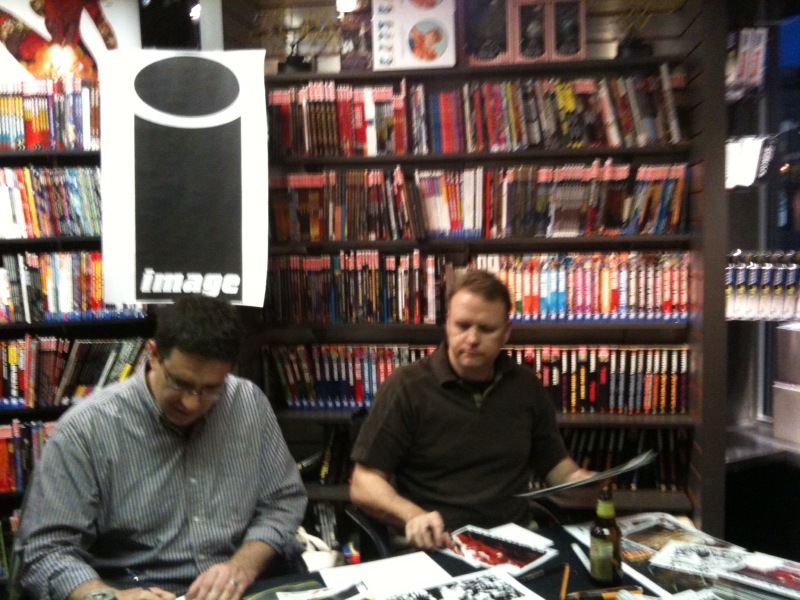 Steve Lieber and Jeff Parker sign copies of Image Comics' Underground with help from MacTarnahan's! 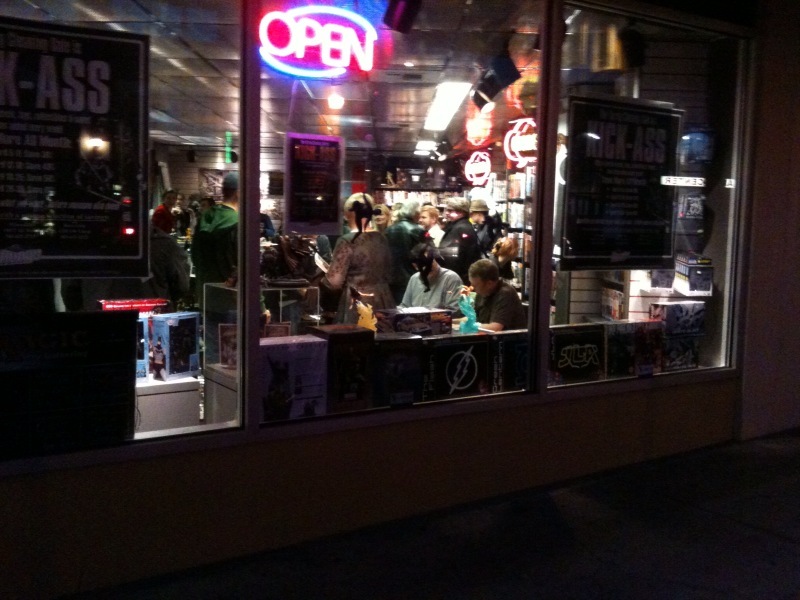 The Underground release party at the Hollywood Things From Another World was a rousing success last night, packed full of people who came out to celebrate Steve Lieber and Jeff Parker’s Underground graphic novel. We want to express our sincere thanks to Steve and Jeff, as well as colorist Ron Chan! 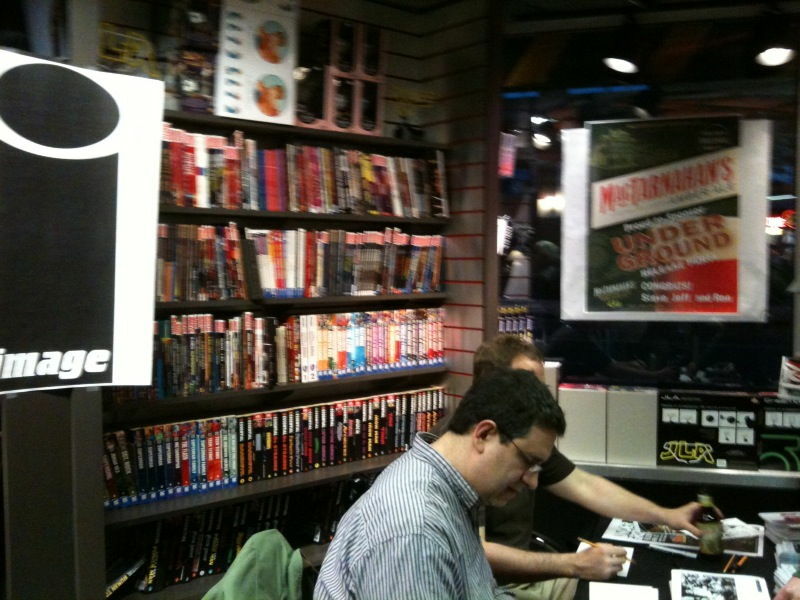 Our thanks also go out to Image Comics, a huge supporter of the event, which donated copies of Underground issues #1 through #5! Steve and Jeff also provided free Underground prints, which they signed throughout the evening. 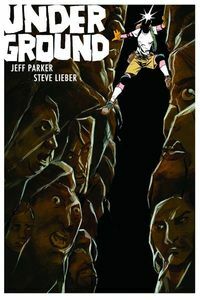 Plus, attendees who pre-ordered a copy of the Underground trade paperback at the party will receive free insert sketches from Steve Lieber himself! We also want to express our gratitude to Mark Carver of MacTarnahan’s Brewing, who donated beer for the party, which was much appreciated by the 21 and older crowd, and our friends at Geek in the City! 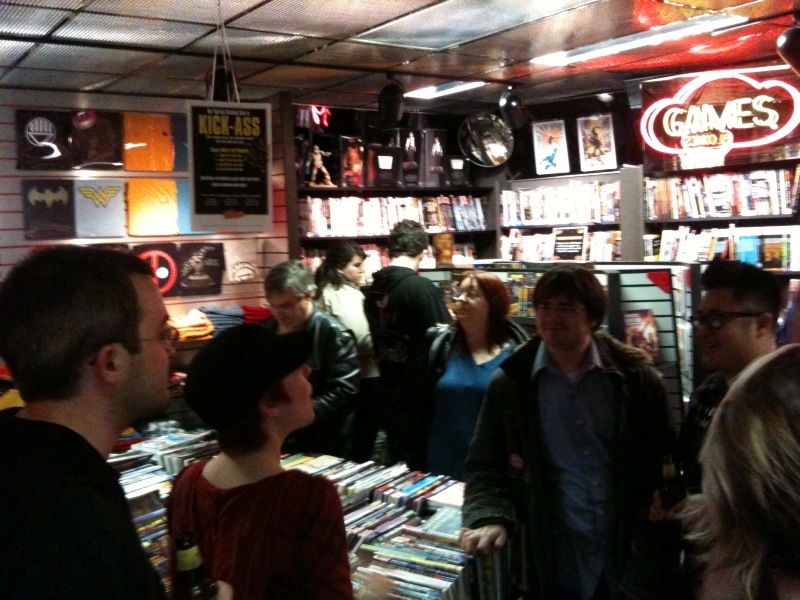 Of course, this party would not have been a success without the awesome Portland comics community and fans. This was our first “after hours” party of this type at any of our stores, so we were thrilled that all of you came–it was a packed house full of the most creative, entertaining, enthusiastic attendees in Portland. Thank you! Check out a video and photo gallery below! Steve Lieber and Jeff Parker were besieged by eager fans for sketches and more. 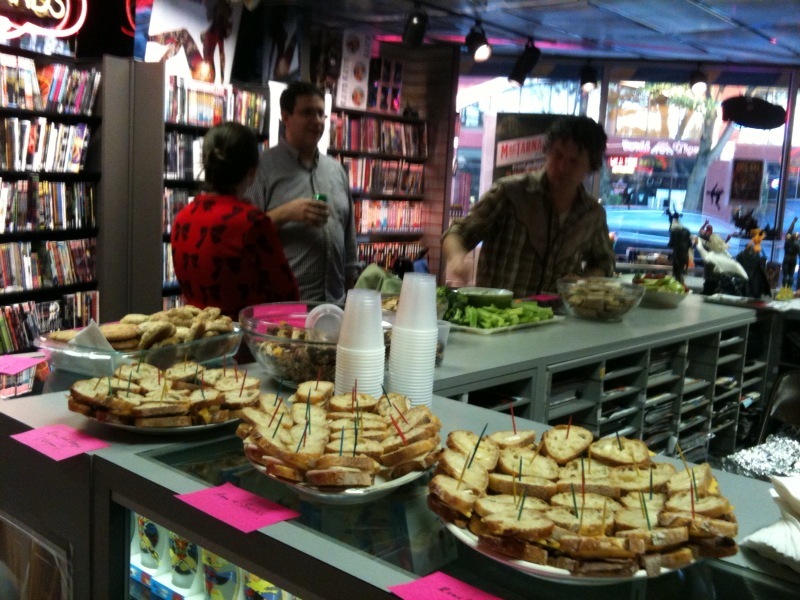 Steve Lieber and Dark Horse's Scott Allie enjoyed food from Clean Plate Catering. 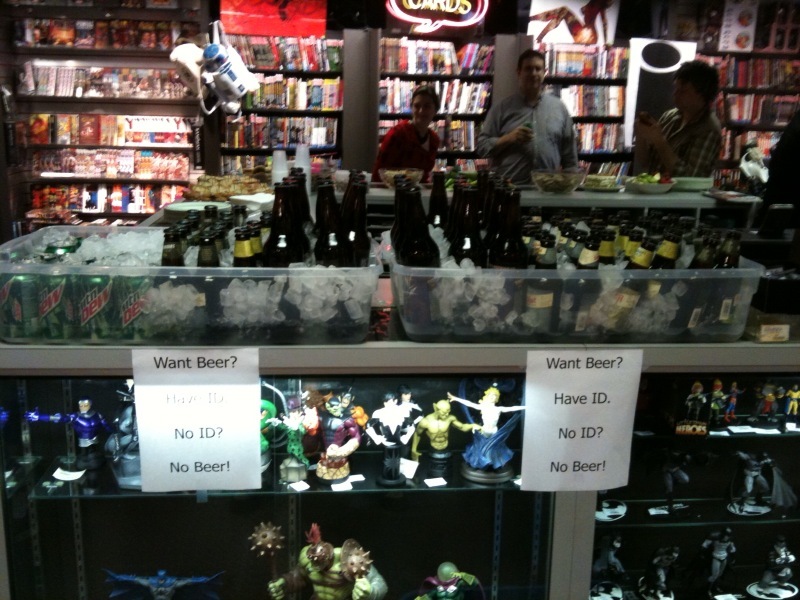 MacTarnahan's provided us with an excellent selection of beer--show us ID! Fans and local comics creators like Erika Moen (DAR) mingled and talked comics. The view from outside our Hollywood location. Folks lingered and chatted all evening.